Employers are showing increased interest in offsetting low increases in Base Salary by offering higher incentive payment opportunities. The results of the latest MHR Global Remuneration survey – New Zealand’s longest established commercial remuneration survey – show that potential incentive payments for both Top Executive and General Staff have increased in the last twelve months. 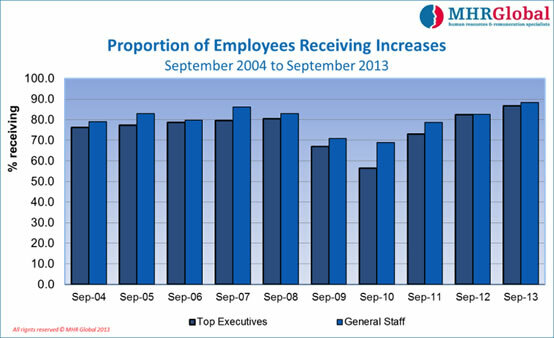 Over the same period, the average increase in Base Salary has largely stabilised at 3.6 percent for Top Executives and 3.2 percent for General Staff. Managing Director of MHR Global, Kevin McBride, indicated that over the past ten years, the opportunity to earn incentive payments has been relatively stable, representing on average around 16 percent of salary for Top Executives and about 7.5 percent on average for General Staff. Mr McBride suggested that such a move is a pragmatic response to lower pay increases in recent years, as it allows employers to recognise the performance and contribution of high performing employees, without increasing payments to all staff on an ongoing basis. “The combination of fair pay increases – to offset increased costs of living and recognise ongoing performance – and higher potential earnings through increased incentive payments for high performing staff, provides employers with greater flexibility to manage remuneration costs effectively at a time when financial constraints are continuing”.